Now in its 3rd year, Nenagh Castlefest has grown year on year to bring the town of Nenagh alive for midsummer. 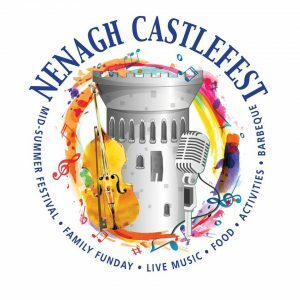 Come to the grounds of the majestic 12th century keep of Nenagh Castle, where you will find live music from across the genres including some of the top acts in the country and from the UK, open-air barbecue, funfair and activities for the children, castle tours, crafts and much more. Bring your picnic or enjoy some of the finest foods produced locally while listening to your favourite tunes in a safe environment. And best of all – it’s all free entry! Outside the castle, there will be traditional music workshops, concert and live music in many pubs across the town. Or why not treat yourself to something nice to eat from one of the town’s many fine eateries? Plenty of parking and everything within walking distance.